Capture Mobile Test Unit was officially launched on Friday. emissions for the investment made could be considerable. I find it staggering that the Tories and UKIP would rather let robbers, fraudsters and even killers go free rather than work with our European neighbours on tackling crime. It's difficult to believe that they didn't support the European Arrest Warrant. They are putting dogma before our safety. Ed Davey was right on Radio Four's Today programme to criticise the Tories and UKIP for this. Take a look at the Lib Dems' European Election website for more information. Gordon Brown has done the decent and honourable thing by granting Gurkhas, who've served for at least four years, the right to live here if they choose. In a week when Parliament has not covered itself in glory this decision will go someway to restore that reputation. Nick Clegg has skilfully managed the campaign in Parliament with the outstanding support of Joanna Lumley and Councillor Peter Carroll outside Parliament. Chris Rennard has changed the Liberal Democrats out of all recognition. From a party with only a few MPs he has turned us into an effective fighting force across the UK. I'm sad that he has decided to stand down as Chief Executive of the Party in the summer but am very grateful for all he has done for us. He'll still be around - helping us to win over and over again. The Financial Services Authority, Bank of England and the Treasury appeared before the Scottish Affairs Select Committee today in the first evidence session for the Dunfermline Building Society inquiry. Despite effective probing from MPs Ian Davidson and Alistair Carmichael about why they failed to spot and stop the "reckless decision making" at the Society, they said they had done nothing wrong. If Society was so reckless surely they should have stepped in to put an end to end. But they didn't. This another example of the failure of regulation. Tories would rather let criminals go free than work with Europe! Lib Dem Chris Huhne has just launched a new set of post cards and leaflets for the European Election Campaign. They show that the Tories put dogma before our safety with their ideological opposition to Europe. They are so opposed to working with our European neighbours that they would rather let criminals go free. They would scrap the European Arrest Warrant that has led to the speedy extradition of thousands of criminals across Europe. In my adjournment debate this evening at 10pm I will be begging (yes begging) the Government to step in, reach an agreement and resolve the current uncertainty over the new Forth Crossing. The SNP Government in Scotland has been in power for two years now but despite the bridge being a priority they haven't settled the funding issue. The Scottish Futures Trust hasn't raised a single penny. They seem more interested in another bust up with Westminster that securing Scotland's premier transport artery. If the SNP are so determined to use this as a political football I have no option but to seek direct support from Westminster who have already accepted the principle of direct support but have not come forward with new money yet. When it first opened in the mid nineties Deep Sea World at North Queensferry was attracting massive crowds - up to five thousand a day. The queues were so long it took staff an hour to walk from one end to the other to entertain the waiting visitors. During my visit yesterday I discovered that special world below the Forth Bridge hasn't lost its appeal. That underwater moving walkway still sparks the imagination and the Centre is constantly evolving with new exhibits. But what shone out was the contribution that the staff make to the experience. From when I first walked through the front door when all three assistant smiled a warm welcome to Gerry the manager enthusiastically showing me his centre liking a doting father I could tell that the staff would do their very best make this Deep Sea World special for each and every visitor. I'm immensely grateful to MPs Alistair Burt, Jim Fitzpatrick and Chris Chope for their support today. If it wasn't for them my Driving Instructors Bill on the power to suspend driving instructors convicted of serious offences would have failed to get its Second Reading. It's very unusual for Presentation Bills to progress without debate on Private Members Business. The Government and Official Opposition regard it as standard practice to object and it only takes one MP to object for a bill to fail to proceed. Last month when my Bill was up for consideration it received an objection but thanks to Alistair, Jim and Chris the path was cleared today and it received no objection at the end of business at 2.30pm. The Bill now goes to Committee for detailed consideration before returning to the floor of the House. I've been at this for two and a half years following the sexual assault of one of my constituents by her driving instructor. Even after conviction he was allowed to continue teaching for six weeks before he was finally barred. If the Bill passes all its stages the Driving Standards Agency will have the power to suspend immediately. In response to my question on Monday Work and Pensions Minister Kitty Usher dismissed the concerns of landlords who are getting stung by the changes to the housing benefit rules. The changes mean almost all tenants now receive their housing benefit instead of it going direct to the private landlord. That is a good principle as it technically empowers tenants but too many are preyed on by loan sharks and other creditors leaving them vulnerable. The result is that landlords are left to carry the can and many are simply refusing to take on housing benefit clients as a result. I fear for the effect on homelessness if too many good private landlords leave the sector. We need a more sensitive system that ensures tenants and landlords do not lose out. The minister says councils have the discretion to reintroduce direct payments before the eight week deadline for non payment of rent but a fraction earlier is not sufficient. The trigger period needs to be much, much earlier than that. I will continue to argue the case with the minister. There was a good story in the Independent on Sunday setting out our approach to the European Election Campaign on crime and Europe. It's certainly worth a read. The Tories have really got a lot of explaining to do on their isolationist approach. They seem so obsessed about distancing the UK from Europe that they are prepared to make our country less safe in the process. Dogma over safety. Today's launch of the Lib Dem European Election Campaign was feisty and upbeat. We set out the dangers of isolating Britain from our European neighbours. Nick Clegg, Andrew Duff and Sarah Ludford were on top form, confidently setting out why a Tory vote would be a wasted vote in the European Elections. Their decision to cut themselves off from the mainstream of European politics by leaving the EPP group means they will have little say in the future direction of Europe. The trio also set out why the Conservative isolation policies would make Britain a less safe place to live. The Tories are opposed to working together with other countries on justice matters like the European Arrest Warrant that has led to the speedy extradition of thousands of suspected criminals across Europe. Finally, Nick was strongly dismissive of Labour. Stating that they are finished he argued that if Gordon Brown can't even make friends with his own cabinet it's not a surprise that he can't make friends with our neighbours in Europe. 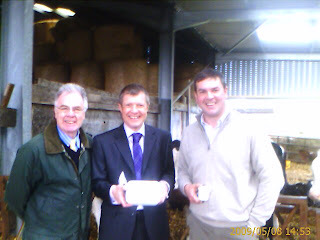 Councillor Gerry McMullan and I ventured out onto Blair Mains Farm at Culross to get a taste of the soon to be famous ice cream made by the Nelson's from milk produced by their own cows. After only two years on the go the business - and its tasty ice cream - is already making a mark in the local area. In Scottish Questions today I challenged the Scottish Secretary Jim Murphy to reach an agreement with Alex Salmond on the funding of the replacement Forth Road Bridge. This saga has been dragging on for too long and is in danger of affecting investment and jobs. The UK Government has accepted in principle their responsibility to assist yet have not offered real, new money - only funds that were already coming to Scotland. The SNP also need to explore all methods of p aying for the crossing instead of simply blaming London. They haven't raised a single penny from their Scottish Futures Trust for the bridge. I fear that Alex Salmond and Jim Murphy are letting their political differences get in the way of finding a solution to this vital project for Scotland. Their stubbornness is damaging. 6. Willie Rennie (Dunfermline and West Fife) (LD): What the outcomes were of his recent discussions with the Chief Secretary of the Treasury and the Cabinet Secretary for Finance and Sustainable Growth in the Scottish Executive on funding for the construction of a new crossing over the River Forth. The Secretary of State for Scotland (Mr. Jim Murphy): I want to see the new crossing over the River Forth built. 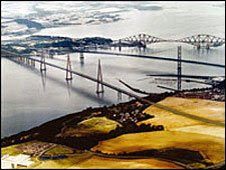 We had a constructive meeting on 4 March and identified a number of ways of dealing with the funding of a new bridge. Willie Rennie: I thank the Scottish Secretary for that answer. People in Fife are getting exasperated by the failure of the Scottish Executive and the UK Government to reach an agreement on this. The £1 billion that has been offered is not new money, and not a single penny has been raised by the Scottish Government to pay for this bridge. I know that the Scottish Secretary and the First Minister aren't best buddies, but can they please kiss and make up and sort out this problem before it has an effect on Scottish jobs and Scottish investment? Mr. Murphy: I know that the hon. Gentleman has been campaigning for this bridge for some time, as have my hon. Friend the Member for Glenrothes (Lindsay Roy) and others in Fife. We had that meeting, and we offered a package of support of up to £1 billion for the new Forth road crossing, including £500 million as consequentials from Crossrail. I am disappointed, and I think all of Scotland will be disappointed, that the Scottish Government at the moment refuse to accept this offer of unprecedented support for this Forth crossing, but despite the opposition, the offer still lies on the table. The First Delegated Legislation Committee isn't usually the most riveting experience but today it was an opportunity to press the Treasury Minister on the Dunfermline Building Society. Today, there were three orders for consideration and the government were seeking the approval of the House of Commons for its decision to break up of the Society. I asked when the approx. 150 members of the Society's final salary pension scheme will receive assurances on their pensions as the scheme has been put into administration. The Minister, Ian Pearson, wasn't able to give me any public assurances but agreed to write to me with a detailed public response soon. I also wanted to know if the quality of service provided to the housing associations from DBS Ltd - the bridge bank for the social housing loan book - will be maintained at a high level. As the loan book is currently being sold there is a danger the quality of service will be diminished through that process. The Minister took the message. Finally, I asked about the potential for the administrators, KPMG, to milk the fees for the service they are providing for the commercial loan book put into administration. The minister indicated he was sympathetic. We'll see if any action is taken. I was disappointed with the insubstantial nature of the Minister's responses but hopefully the issues I raised will be taken on board. Last week I visited the opencast coal mine at Muir Dean, Crossgates for the first time. I was shown the mine operations, the safety measures, the temporary water treatment process, the development of the permanent treatment process and the mound. I relayed the results of my quick survey of local residents who were concerned about the blasting and the water levels. ATH were surprised about the blasting and agreed to feed that into the safety process. They had experienced no difficulties with the water levels and encountered no subsidence as a result of any change. I want to hear from local people about their experiences of the site. I was delighted by last week's vote on the Gurkhas. Parliament did the decent thing. But the battle continues as we need to make sure the Government accepts the will of Parliament and brings forward a package that gives settlement rights to the Gurkhas. 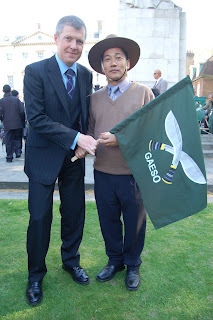 I've received a big response from local people who hold the Gurkhas in high regard. I backed the government's previous strategy on Afghanistan and the new one seems OK too. But the real problem has been, and will continue to be, successful delivery of that strategy. Many people I speak to don't believe we should have troops there and equate Afghanistan with Iraq. I opposed the invasion in Iraq but support our effort in Afghanistan. We need to prevent Al Qaeda from using Afghanistan for training cam. If we don't we'll find that we will have more terrorist attacks in the UK. Part of the solution in the country is in the hands of the other countries in the region like Iran, Russia, China and even India. Yet the PM's statement today didn't even mention those countries. I will continue to quiz the government on Afghanistan and Pakistan as the pace of improvement is not good enough.